(1982) "I Won't Hold You Back"
"Africa" is a song recorded by the American band Toto in 1981, for their fourth studio album Toto IV, and released as the album's third single on September 30, 1982, through Columbia Records. The song was written by band members David Paich and Jeff Porcaro, and composed by Toto. The soft rock and jazz fusion song lyrically incorporates themes of love and location, but is described by Porcaro as being about "a white boy [writing about] Africa, but since he’s never been there, he can only tell what he’s seen on TV or remembers in the past." Critics praised its composition and Toto's performances. The song reached number one on the United States' Billboard Hot 100 chart, and is the band's only Billboard number one. The song remained at the top for a single week (February 5, 1983). "Africa" also peaked in the top ten in the United Kingdom, Canada, Ireland, Netherlands, New Zealand and Switzerland. The song was accompanied by a music video, which premiered in 1983, and was directed by Steve Barron, who collaborated previously with the group for "Rosanna". The video features Toto in a library, as they perform and showcase various aspects of African culture. While popular in the 1980s and 1990s, with the song being certified gold by the RIAA in 1991, "Africa" saw a resurgence in popularity via social media during the mid to late 2010s, including a fan-requested cover by American rock band Weezer which peaked at number 51 on the Billboard Hot 100. It has since been certified quadruple platinum. In January 2019, a sound installation was set up in an undisclosed location in the Namib Desert to play the song on a constant loop. The installation is powered by solar batteries, allowing the song to be played indefinitely. The initial idea and lyrics for the song came from David Paich. Paich was playing around with a new keyboard, the CS-80, and found the brassy sound that became the opening riff. He started humming a melody and by the chorus, the words had fell into place. Paich, who at the time had never set foot in Africa, based the landscape descriptions from an article in National Geographic. Jeff Porcaro explains the idea behind the song: "A white boy is trying to write a song on Africa, but since he's never been there, he can only tell what he's seen on TV or remembers in the past." At the beginning of the '80s I watched a late night documentary on TV about all the terrible death and suffering of the people in Africa. It both moved and appalled me, and the pictures just wouldn't leave my head. I tried to imagine how I'd feel about if I was there and what I'd do. In 2015, Paich explained that the song is about a man's love of a continent, Africa, rather than just a personal romance. In 2018, Paich explained the song is about a person flying in to meet a lonely missionary. As a child, Paich attended a Catholic school. Several of the teachers had done missionary work in Africa, and this became the inspiration behind the line: "I bless the rains down in Africa." Musically, the song took quite some time to assemble. Steve Porcaro, the band's synth player, introduced Paich to the Yamaha CS-80, a polyphonic analog synthesizer, and instructed him to write a song specifically with the keyboard in mind. Paich gravitated towards a brassy flute sound, which he found to be a unique alternative to the piano. In order to create a suitable kalimba sound, Porcaro programmed six tracks of GS 1. Each track featured a one-three note gamelan phrase with different musical parameter. So when we were doing "Africa" I set up a bass drum, snare drum and a hi-hat, and Lenny Castro set up right in front of me with a conga. We looked at each other and just started playing the basic groove. [...] The backbeat is on 3, so it's a half-time feel, and it's 16th notes on the hi-hat. Lenny started playing a conga pattern. We played for five minutes on tape, no click, no nothing. We just played. And I was singing the bass line for 'Africa' in my mind, so we had a relative tempo. Lenny and I went into the booth and listened back to the five minutes of that same boring pattern. We picked out the best two bars that we thought were grooving, and we marked those two bars on tape. [...] Maybe it would have taken two minutes to program that in the Linn, and it took about half an hour to do this. But a Linn machine doesn't feel like that! Porcaro also acknowledged that he was influenced by the sounds created by fellow Los Angeles session musicians Milt Holland and Emil Richards. He also described the influence of the drummers at the Africa pavilion at the 1964 New York World's Fair and a National Geographic Special. I was about 11 when the New York World's Fair took place, and I went to the African pavilion with my family. I saw the real thing ... It was the first time I witnessed somebody playing one beat and not straying from it, like a religious experience, where it gets loud, and everyone goes into a trance. During an appearance on the radio station KROQ-FM, Steve Porcaro and Steve Lukather described the song as "dumb" and "an experiment" and some of the lyrics as "goofy" that were just placeholders. It was also the last song recorded and barely made the album. The band was more focused on the album's lead single "Rosanna" instead. The music video was directed by Steve Barron. In the video, a researcher in a library (portrayed by band member David Paich) tries to match a scrap of a picture of a shield to the book from which it was torn out. As he continues his search, a librarian (Jenny Douglas-McRae) working at a nearby desk takes occasional notice of him, while natives in the surrounding jungle begin to close in on the library. When the researcher finds a book titled Africa, the native throws a spear (the shield the native carries is the same as the one in the picture), toppling stacks of books. Africa falls open to the page from which the scrap was torn, but a lantern lands on it and sets it on fire, after which the librarian's eyeglasses are shown falling to the floor. The scenes are intercut with shots of a spinning globe and the band performing atop a stack of giant hardcover books, in which Africa is the topmost. This video also features Mike Porcaro on bass, replacing David Hungate, who had already left the band before the video was made. Lenny Castro is also featured in the video on percussion. As of April 2019, the music video has over 480 million views on YouTube. The song was popular upon its release, hitting number one on the Billboard Hot 100 in February 1983, and the song has continued to be a popular soft-rock classic up to the 21st century. The song has been utilized in many internet memes, has appeared in television shows, such as Stranger Things and South Park, and was used by CBS during their coverage of the funeral of former South African president Nelson Mandela, albeit not without controversy. In 2012, "Africa" was listed by music magazine NME in 32nd place on its list of "50 Most Explosive Choruses." (2018) "Can't Knock the Hustle"
Weezer covered the song, following a fan-initiated social media campaign; it was released on May 29, 2018. In December 2017, Twitter user "@WeezerAfrica," run by 14-year-old Cleveland, Ohio resident Mary Klym, tweeted, "@RiversCuomo it's about time you bless the rains down in Africa." After much back-and-forth between Mary and Weezer's drummer, Patrick Wilson, the band released a cover of "Rosanna", a different Toto song, in order to troll Klym and those clamoring for a version of Africa. Weezer finally released "Africa" on May 29, 2018. It was the band's first Hot 100 hit since 2009. "Africa" reached number 51 on the Hot 100, and peaked at number-one on the Billboard Alternative Songs chart in August 2018, becoming the band's first number-one single since "Pork and Beans" in 2008. A limited edition 7-inch vinyl pressing was released by Weezer in July 2018 and sold exclusively through Urban Outfitters. The pressing was limited to 1500 copies, with "Africa" as the A-side and "Rosanna" as the B-side. The cover artwork features a background of palm fronds with the tweet that inspired the song in the center of the cover. Shortly after the song's release, Weezer appeared on Jimmy Kimmel Live! along with keyboardist Steve Porcaro of Toto to promote the single. Toto responded on August 9, 2018, by releasing a cover of Weezer's 2001 single "Hash Pipe", after debuting it in concert a week prior. Weezer released a music video of their "Africa" cover in September 2018, styled as a parody of the video for their earlier single "Undone – The Sweater Song." Stand-ins for the band members perform the song on a soundstage, with "Weird Al" Yankovic replacing singer/guitarist Rivers Cuomo, with his band members replacing Weezer. Yankovic had previously appeared onstage during the band's tour to perform "Africa" with them. Weezer included the cover on their surprise release of the all-covers "Teal Album" in January 2019. 2007: Lebanese-Canadian pop and R&B singer Karl Wolf sampled "Africa" in his own remake, also called "Africa", with added lyrics and musical composition and arrangement. The Karl Wolf song featured a rap section by the Canadian-Bahamian rapper Culture. The track served as the first single from his 2007 second studio album, Bite the Bullet, and reached number two on the Billboard Canadian Hot 100. 2010: In the first episode of the second season of Community, characters Troy Barnes, Abed Nadir, and anthropology professor June Bauer perform an anthropology-themed rap song that ends with the chorus of "Africa". 2011: R&B singer Jason Derulo incorporated re-sung lyrics from "Africa" in his song "Fight for You", the fourth single from his 2011 album Future History. 2018: Rapper Pitbull and Rhea heavily sampled "Africa" on their song "Ocean to Ocean" for the soundtrack to Aquaman. ^ a b "Toto - Africa at Discogs. [ONLINE]". Archived from the original on October 27, 2016. Retrieved May 1, 2016. ^ Deggans, Eric (August 20, 2014). "Review: Toto, Michael McDonald showcase stellar '70s chops at Ruth Eckerd Hall in Clearwater". Tampa Bay Times. Archived from the original on September 9, 2017. Retrieved September 15, 2017. ^ Monger, James Christopher. "Toto – Hold the Line: The Best of Toto". AllMusic. Retrieved September 15, 2017. ^ Zellner, Xander (June 13, 2018). "Weezer Returns to Hot 100 With Fan-Inspired Cover of Toto's 'Africa'". Billboard. Retrieved June 15, 2018. ^ a b "Africa by Toto to play on eternal loop 'down in Africa'". BBC News. Retrieved January 14, 2019. ^ a b c d Kovarsky, Jerry (July 13, 2015). "TOTO: The Synth Statesmen of Progressive Pop Return". Keyboard. Retrieved April 18, 2018. ^ a b c Simpson, Dave (January 30, 2018). "Toto: how we made Africa". the Guardian. ^ "Official TOTO Website - Encyclopedia". www.toto99.com. April 18, 2007. Archived from the original on July 14, 2012. Retrieved December 2, 2015. ^ "Official TOTO Website - Releases". www.toto99.com. Archived from the original on September 28, 2011. Retrieved November 3, 2011. ^ Melissa Locker (May 5, 2015). "Q&'80s: Toto's Dave Paich on Writing and Recording 'Africa'". Grantland.com. (end paragraph 2 and 8). Archived from the original on June 25, 2016. Retrieved June 4, 2016. ^ Flans, Robyn (November 1988). "Jeff Porcaro: the feel of the music". Modern Drummer. Archived from the original on 2018. ^ a b "Stryker Chats with Toto About Weezer 'Hash Pipe' Cover". Omny Studio (Podcast). KROQFM: On-Demand. July 28, 2018. Retrieved August 9, 2018. ^ "Toto - "Africa"". mvdbase.com. Archived from the original on June 6, 2011. Retrieved November 3, 2011. ^ a b "Toto - Africa (Official Music Video)". YouTube. Retrieved January 16, 2018. ^ "Toto's 'Africa': The mother of all memes is waiting there for you". Boston Globe. Retrieved November 1, 2018. ^ "How Toto's 'Africa' Became the New 'Don't Stop Believin". Rolling Stone. Retrieved November 1, 2018. ^ "50 Most Explosive Choruses - #32 Toto - Africa". NME. Archived from the original on April 2, 2015. ^ Kent, David (1993). Australian Chart Book 1970–1992. Australian Chart Book. ISBN 0-646-11917-6. ^ "Austriancharts.at – Toto – Africa" (in German). Ö3 Austria Top 40. ^ "Ultratop.be – Toto – Africa" (in Dutch). Ultratop 50. ^ "The Irish Charts – Search Results – Africa". Irish Singles Chart. ^ "Dutchcharts.nl – Toto – Africa" (in Dutch). Single Top 100. ^ "Charts.nz – Toto – Africa". Top 40 Singles. ^ "Swisscharts.com – Toto – Africa". Swiss Singles Chart. ^ "Toto: Artist Chart History". Official Charts Company. ^ "Toto Chart History (Hot 100)". Billboard. ^ "Toto Chart History (Adult Contemporary)". Billboard. ^ "Offiziellecharts.de – Toto – Africa". GfK Entertainment Charts. ^ "NZ Top 40 Singles Chart - 20 May 2013". Official New Zealand Music Chart. Recorded Music New Zealand. May 20, 2013. Archived from the original on May 7, 2017. Retrieved October 25, 2016. ^ "SloTop50: Slovenian official singles weekly chart" (in Slovenian). SloTop50. Retrieved May 12, 2013. ^ "Listy bestsellerów, wyróżnienia :: Związek Producentów Audio-Video". Polish Airplay Top 100. Retrieved December 11, 2018. ^ "Talent Almanac 1984" (PDF). Billboard. 95 (52). Billboard Publications. December 24, 1983. p. TA-18. ISSN 0006-2510. Retrieved February 25, 2017. ^ "ARIA Charts – Accreditations – 2019 Singles". Australian Recording Industry Association. Retrieved February 19, 2019. ^ "Canadian single certifications – Toto – Africa". Music Canada. ^ "Toto "Africa"". IFPI Denmark. Retrieved January 23, 2018. 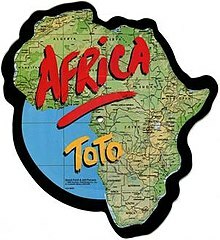 ^ "Italian single certifications – Toto – Africa" (in Italian). Federazione Industria Musicale Italiana. Retrieved December 27, 2017. Select "Tutti gli anni" in the "Anno" drop-down menu. Select "Africa" in the "Filtra" field. Select "Singoli online" under "Sezione". ^ "New Zealand single certifications – Toto – Africa". Recorded Music NZ. ^ "British single certifications – Toto – Africa". British Phonographic Industry. Select singles in the Format field. Select Silver in the Certification field. Type Africa in the "Search BPI Awards" field and then press Enter. ^ "British single certifications – Toto – Africa". British Phonographic Industry. Select singles in the Format field. Select Platinum in the Certification field. Type Africa in the "Search BPI Awards" field and then press Enter. ^ "American single certifications – Toto – Africa". Recording Industry Association of America. If necessary, click Advanced, then click Format, then select Single, then click SEARCH. ^ "Weezer's Cover of "Africa" Is Now Officially A Thing With It Charting In The Top 100 And Being Performed On 'Kimmel' / the NOISE". Bringthenoise.com. 2018-06-13. Retrieved 2019-01-20. ^ "Meet the Hero Teen Determined to Convince Weezer to Cover Toto's "Africa" - Noisey". Noisey.vice.com. 2017-12-08. Retrieved 2019-01-20. ^ "The Scoreboard: Weezer, Toto, Kanye West, Drake, Ariana Grande". Uproxx.com. Retrieved 2019-01-20. ^ Petrusich, Amanda (May 30, 2018). "Hurry, Boy, It's Waiting There for You: Weezer Covers "Africa"". The New Yorker. Retrieved June 2, 2018. ^ McKinstry, Lee. "Teen Tweets Weezer Into Covering "Africa"". Cleveland Magazine. Retrieved August 13, 2018. ^ Monroe, Jazz (May 24, 2018). "Weezer Cover Toto's "Rosanna," Trolling Viral Campaign for "Africa" Cover". Pitchfork. Retrieved June 2, 2018. ^ Goldberg, Benjamin. "Weezer's Toto cover is the band's biggest hit in a decade". The A.V. Club. Onion, Inc. Retrieved August 10, 2018. ^ "Alternative Songs: Top Alternative Songs Chart". Billboard. Retrieved August 11, 2018. ^ Trapp, Phillip. "Weezer Announce Limited Africa Vinyl, But Good Luck Getting One". Altpress. Retrieved August 10, 2018. ^ a b "Weezer's "Africa" Cover Gets Vinyl Release". Pitchfork. Retrieved August 10, 2018. ^ Roffman, Michael (July 31, 2018). "Toto have never sounded younger covering Weezer's "Hash Pipe": Watch". Consequence of Sound. Retrieved August 14, 2018. ^ Roffman, Michael (August 9, 2018). "Toto finally share studio version of Weezer's "Hash Pipe": Stream". Consequence of Sound. Retrieved August 14, 2018. ^ "Weezer Surprise-Releases Covers Album". Variety. January 23, 2019. Retrieved January 24, 2019. ^ "Weezer Chart History (Canada Rock)". Billboard. Retrieved September 19, 2018. ^ "Weezer Album & Song Chart History". Billboard Mexico Ingles Airplay for Interpol. Retrieved August 28, 2018. ^ "Weezer Chart History (Hot 100)". Billboard. Retrieved September 18, 2018. ^ "Weezer Chart History (Adult Contemporary)". Billboard. Retrieved August 28, 2018. ^ "Weezer Chart History (Adult Pop Songs)". Billboard. Retrieved August 28, 2018. ^ "Weezer Chart History (Hot Rock Songs)". Billboard. Retrieved September 18, 2018. ^ "Weezer Chart History (Pop Songs)". Billboard. Retrieved September 25, 2018. ^ "Adult Pop Songs – Year-End 2018". Billboard. Retrieved January 9, 2019. ^ "Adult Contemporary Songs – Year-End 2018". Billboard. Retrieved January 9, 2019. ^ "Digital Song Sales – Year-End 2018". Billboard. Retrieved January 9, 2019. ^ "Hot Rock Songs – Year-End 2018". Billboard. Retrieved January 9, 2019. ^ Joel Whitburn's music yearbook 2003. Whitburn, Joel. Menomonee Falls, Wis.: Record Research. 2004. p. 91. ISBN 9780898201598. OCLC 57662663. ^ "Singles". Billboard. March 31, 2007. p. 52. ^ "Karl Wolf". billboard.com. Archived from the original on August 15, 2015. ^ "Bacall & Malo - Africa". swedishcharts.com. ^ Reitman, Shelby. "Pitbull Puts an Oceanic Spin on Toto's 'Africa' for 'Aquaman' Soundtrack". Billboard. Retrieved December 15, 2018.